Year after year, this classic makes a statement every time it gets served. With just enough lime to feel sour, the right balance of condensed milk and just enough egg yolk to stabilize but not overwhelmed color. Key Lime Pie with Meringue and white chocolate flower. I still remember my first key lime pie. I wish I had a picture of it! Only if pictures where that easy at that time. While contain by the cake base it all looked good, but once mama cut it the cream came out like a strong river stream. While in school in baking school in Argentina a friend shared her recipe. Don't take me wrong, I still thank Andrea for sharing her recipe, but in my modest opinion it was way to yellow for me. It had too many egg yolks that it would tear in the oven . Key Lime Pie made in Argentina, when it would be too yellowish and tear in the oven. So, we embarked in the phenomenal process of recipe playing. 12 recipes later, we came up with this recipe. We decided that no zest would be used, we wanted the cream to be plain and smooth. Prepare the baking tart with the sablee dough. Place foil paper on it and a few beans. Bake it for 20 minutes, remove beans and cook for 5 more minutes. Remove from the oven, and let cool down. In the meantime, on a medium bowl combine the egg yolks, condensed milk, and lime juice. Mix until all is well intregrated. Pour into pie and cook at 330 for 10 minutes. Meringue: On a small pot, place the water and sugar on high. When the syrup starts boiling and you could see bubbles on the top, place the egg whites on the bowl of your stand mixer with the whisk attachment on medium speed. Let the sugar syrup to continue boiling until it reaches 113C. From the corner of the bowl pour very softly the sugar syrup, increase the speed to high and continue mixing until the bowl reaches room temperature. Decorate the pie as yo wish. For the Key Lime Pie in the picture I used Wilton tip 1M. 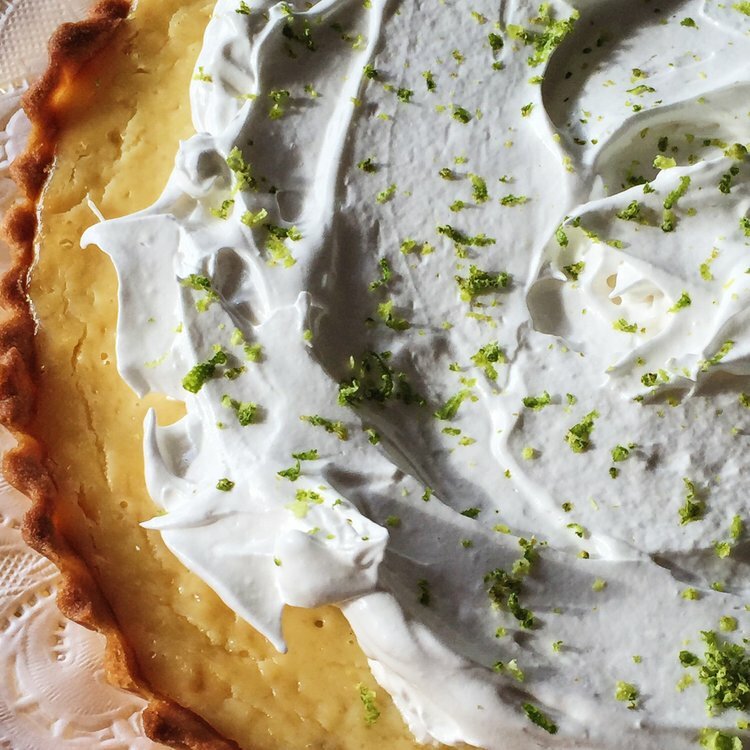 ** TIP: The key lime pie cream could be made in advanced and store in the refrigerator for up to ten days. The Meringue needs to be used right away.